After even the most thorough post-fire cleaning, there can still be lingering smoke odours unless a technique called thermal fogging is used. Thermal fogging is a process where a deodorizer is heated and sprayed in a fog form. Because it’s in a fog form, the mixture is able to permeate even the toughest-to-reach spots. The mixture attaches to the smoke particles and absorbs them, thus neutralizing any odour. The thermal fogging process is a favoured technique to remove smoke odours from tobacco, fireplaces, and fires. The process is important, because it doesn’t just neutralize the odours, it also minimizes the health issues associated with any carcinogenic debris. The truth is, damage from a fire is not just messy, it can be dangerous. The smoke odour that remains can still cause serious problems later. If you are living in the space, you are breathing in that air, thus opening yourself up to the possibility of respiratory issues due to the particles in the air. These tiny airborne smoke particles are invisible, so you could be impacted without realizing it. This is especially dangerous for babies, young children, the elderly, and anyone who has a compromised immune system. The odour may be the reason you want the service done, but it acts more as a warning of what is actually in the smoke residue. That’s why you need a professional solution to your problem. The penetrative power of the fog is why it is one of the most popular methods for removing smoke odours. Unlike traditional cleaning methods that are simply applied to surfaces, the fog is able to soak into everything, including carpets, small cracks, walls, and more. The process, when done in conjunction with the rest of essential Paul Davis cleaning services, provides a thorough cleaning experience. Close all exterior doors and windows. Shut off all open flames, including pilot lights. Make sure that pets and individuals will not be present at the site during the process. Remove or cover with sheets or plastic any valuables that you don’t want to come in contact with the fog. Thermal fogging is a key step in the restorative process to return your home or building to its pre-fire condition. 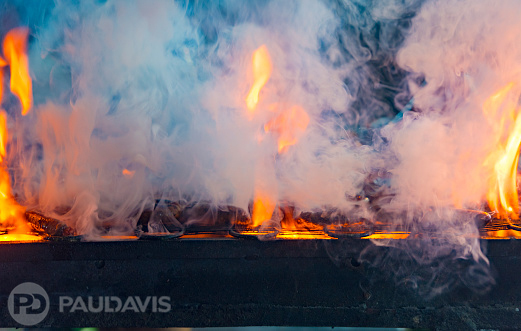 If you have smoke odours you want to have removed from your home or building, you need to call the experts at Paul Davis, because This is no time for second best®.